Welcome to Together For Good! Together For Good is an organization and informational website created to help travelers make a difference in the lives of others. We provide detailed information on a wide variety of opportunities to give back on vacations as well as occasionally bring groups together for trips and events. 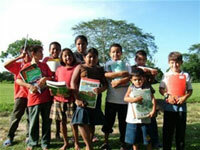 Our staff has more than twenty years of experience in the travel, media and voluntourism fields. Our mission is to encourage travelers to give back on land and cruise vacations in order to improve local communities in the United States, Mexico, Central America, the Caribbean, and throughout the world. Volunteering and making a difference for others can be an incredibly rewarding part of the travel experience. Your assistance can make an impact and help projects and local organizations in communities around the world. Many individuals want to be socially responsible and help others, but do not have the time or money to do a separate extensive volunteer vacation. The goal of this website is to show you how you can make a difference and give back to others as part of any trip you might take. Currently, the Together For Good site lists over 120 opportunities to help others in the United States, Mexico, Central America, and the Caribbean. Travelers can assist with education, the needs of children, community initiatives, animal welfare, healthcare, nature and the environment, historic preservation, and a variety of other activities. A number of resorts and hotels in the United States, Mexico, Central America and the Caribbean are located near schools, community organizations, children's homes, animal shelters, healthcare facilities and other community organizations that could use volunteers and/or in-kind donations. Some resorts and hotels have established foundations and formal programs to support organizations in their areas. The Sandals Foundation, for example, is very active in helping schools and local communities in a number of islands throughout the Caribbean. A few tour operators have also partnered with leading foundations and local groups to help make a difference in communities. If you are vacationing at a resort or hotel and would like to make a difference while in the area, see our page on helping others on resort vacations for suggestions. Cruise vacations are some of the easiest vacations to combine with giving back. Carnival Cruise Line offers meaningful Give Back with Purpose shore excursions in a number of ports of call in Mexico and the Caribbean. Other cruise lines including Crystal Cruises, Holland America Line, and others offer opportunities to make a difference as well. Independent shore excursion companies such as ShoreTrips and local tour providers offer voluntourism experiences, too. In some ports, such as Cozumel, restaurants and beach clubs serve as official drop-off points for donations of school supplies for local charities. Vacationers can plan their own giving back excursions while cruising. 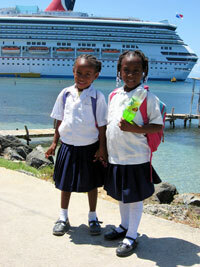 See our page on helping others on cruise vacations for more details. If you are going on vacation to the Caribbean, Mexico or Central America and would like to make a difference, take a look at the destinations directory section of this website to locate just a few of the many organizations that can use your help. Through our research, Together For Good has located over 120 organizations that welcome volunteer assistance and others that need in-kind donations to assist in their endeavors. Some of these organizations have been visited. In many cases, we have relied on the information provided by volunteers, directors, professional contacts and other individuals involved with these groups. We do not guarantee the completeness or accuracy of the information provided. We encourage you to use the information you find here as a starting point for doing your own independent research on these organizations and determining which, if any, you would like to help on your travels. Thank you for visiting our site and for your interest in assisting with education, the needs of children, community initiatives, animal welfare, healthcare, nature and the environment, historic preservation, and a variety of other activities. We can do so much to help others and the world around us, and it is all so easy. Just think of the change that could be made if only five percent of the millions of cruise and resort vacationers pitched in and gave back to local communities. We can make change happen - one person at a time. As John F. Kennedy said, "One person can make a difference and every person should try."